This is a tweaked versions of the official UK 1.2.1 firmware (works with all devices, not just UK ones. Go to Settings > *Development > Locale Picker: to change local to United States). Forced all rendering to be done on the GPU. fixalign -ZipAlign & Fix Permissions on boot. improved rendering of images and text. OptiPNGed and Zipped all system apks. Plus many improvements taken from this thread and many others. Download the modified nook_1_2_update.zip - 126 MB firmware and place it onto the SD you just wrote CWM to. Place SD into NST and boot device. Take out SD and boot device. Setup Wifi and log into your B&N account. ReLaunch-ONLY - This will replace the Home with ReLaunch. ReLaunch+Apps - This will replace the Home with ReLaunch and includes Cleanmaster, Calculator, Clearscreen, Email, ScreenRotator & Opera Mini. EpubBrowser-ONLY - This will replace the Home with EpubBrowser. EpubBrowser+Apps - This will replace the Home with EpubBrowser and includes Cleanmaster, Calculator, Clearscreen, Email, ES File Explorer, ScreenRotator & Opera Mini. init.d+busybox. - Not needed for this ROM. Apps&Games_for_NST - A collection of working apps and games for the Nook. Just unzip and sideload them. Now Install what Home you want to use. EpubBrowser or ReLaunch and any other modules. Once everything is installed leave it for about 5 minutes to let the device optimize all the apps and get everything setup (it will probably reboot). The B&N Welcome screen will flicker. Tap the power button to get rid of it. Tip: To bring up the list of apps installed in EpubBrowser, swipe a clockwise circle starting at 10 O'clock. Once everything has settled down open the NookColor Tools app and un-tick then tick Non-Market apps so you can side load apps. Remember the Nook is running Android 2.1 Éclair (API level 7), so any apps needing a newer version of Android won't load. 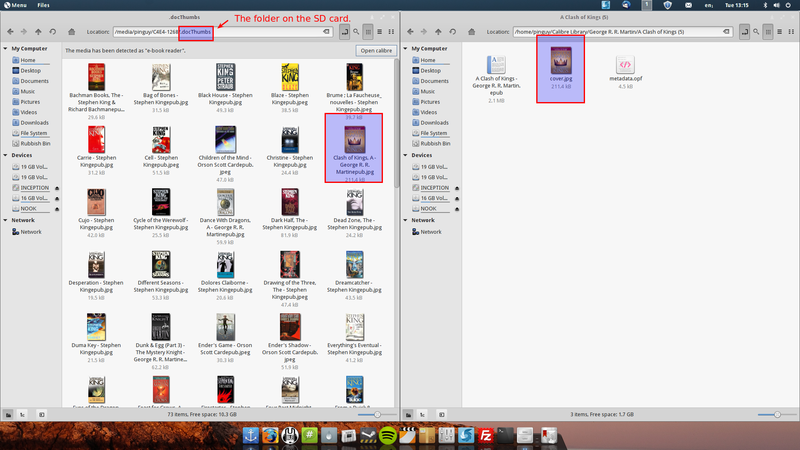 nook_1_2_update.zip - This is just an optimized version of the default UK ROM with init.d+Busybox. EpubBrowser+Apps.zip - This will replace the Home with EpubBrowser and includes Cleanmaster, Calculator, Clearscreen, Email, ES File, ScreenRotator & Opera. USB-Audio+FastMode+Host.zip - Also enables ROOT/SU - Install this after logging into your B&N account. If you install it before you won't be able to register with B&N. If you have under 50% battery life the USB sound dongle will cut out. So make sure you have plenty of battery life. NFHimself for the EpubBrowser home screen. Thank you for this perfected ROM, will try it at some point later. A question if I may: While booting push and hold the lower left and the lower right buttons until you see CWM - this means that you have to write the CWM image to SD card again, after formatting it? And then copy those two Nooter-zip files onto SD card with CWM image? Sorry if my questions looks silly here. All download links are now up and working. How compatible it's with NSTG and its glow functionality? Have installed the ROM and nooter files, but my home screen continuously refreshes. Any idea why? Also tried the separate replacement home file on top of the rooted ROM and it still keeps refreshing. No books are shown in the 6 rectangular boxes. I had the same issue with the Home. What I did to fix it was to find out what book was having issues generating a thumbnail images and changed the cover to a different one using Calibre. You could also manually add the thumbnail images yourself. You do this by coping the image from Calibre library and renaming it the same as the title of the book. You just flash it within CWM. I wish I could figure this out myself, but I just don't know that much about android. I already have a NST and a NSTG rooted with NookManager. Is there anyway to just install this kernel and get the optimizations to run without going through the entire process above? Does this include USB host?